Ring in the thousand years of peace. . .
Wishing a very happy new year to all of you and your families! Wishing all of you the most wonderful of holidays with lots of great times with family and friends! I posted here about the Fall Reading Challenge hosted by Susan at A Southern Daydreamer Reads. During the time of the challenge, September 22 to December 20, I read 15 books. My local library holds a series of book discussions each spring and fall. Five books based upon a theme are chosen for each discussion series. This fall's books were about other cultures and they turned out to be the best reads of the season. Here are my top three books for the fall. The Latehomecomer by Kao Kaila Yang tells the story of a young Hmong woman who immigrated from Thailand to Minnesota with her family. The book tells about the family's challenges in assimilating themselves into a new culture. Two of my children arrived home from college last week. I've been looking forward to this winter break in particular as it will be the first time that no one has a homework assignment to be done over winter vacation. And, as unhappy as I am with my current job assignments, one of the perks is that I work in only one building and I find I rarely have to bring work home these days. This has allowed me to stay on top of the shopping, decorating, and baking for Christmas and I now have some free time on weekends. So do the kids as they are no longer busy with high school activities, so on Saturday we took the train into Philadelphia and indulged in an old tradition. I've spent the last few evenings sending out Christmas cards. Some years I print a "newsletter" and in others, I just include a handwritten note. This is a year when I'm doing a shorter, handwritten note, mainly because I just couldn't get it together to type up the longer letter. I have a long list of relatives to send to since my father came from a family of eleven. I've got a shorter list of high school and college friends and writing notes to them has caused a sort of mental exclamation mark. 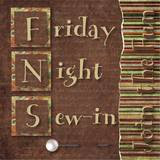 Heidi is hosting Friday Night Sew-In two times this month. I'll be curled up under one of the quilts I'm binding. I got three of them back from the quilter on Sunday and need to have all of them done for Christmas morning. One is done and I've finished about half of another. With the cold weather we've been having, this is the perfect way to spend Friday night. Have you all heard about this challenge starting in January? Robin, Anna,Coni, and Siobhan have either signed on or are thinking about doing this. 15 new projects in 15 days? No way, no how! OK, I'll admit that I did briefly entertain the idea of doing this (and yes, I am easily entertained). Robin's rationale really appealed to me and then there's the fact that I would get to make a new list of projects and I love lists. (Again, I was entertained by reading Anna's potential list of projects and being able to suggest revisions to it.) I certainly have 15 projects of a variety of sizes hanging out in storage tubs so this wouldn't involve buying any new stash. But those four ladies above actually finish projects. Me, um, not so much. Just take a look at my sidebar.